Another photo taken at New Brighton Beach Christchurch NZ. Kite day. Photo was taken in colour and converted using Photoshop CS3 (New Layer B&W). 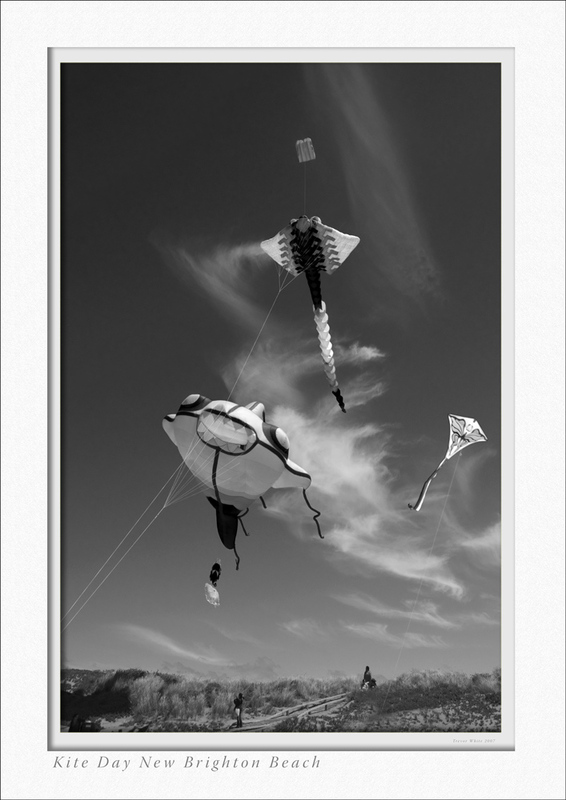 Even though the kites were colourful I am pleased with the B&W versions as it goes with the cloud formation - the kites seem to have a feeling of lightness. Very nice Trev - I really like the mono conversion; a nice soft tone. The sky helps nicely too. A nice subject, captured very nicely indeed. I love everything about this shot and I also agree it works well in B/W. I'm always on the lookout for people flying interesting kites lie those in your photo too but I never seem to have any luck, always finding the boring kites. I believe this is somewhere close to the "Stairway to Heaven"? Nice photo and the greyscale fits nice too. another vote for the tones. A winner in my opinion, lovely smooth gadiation and very clean, clear and sharp, great conversion.